With their long lasting blooms, wide variety of flower colorations, and ease of production, annuals provide gardeners a season long supply of color. Annuals are versatile and can be used to add color to flower beds and borders, used in container plantings and baskets, mixed with vegetables, perennials, shrubs, and trees, or to fill empty spaces in the garden until slower plants grow and mature. 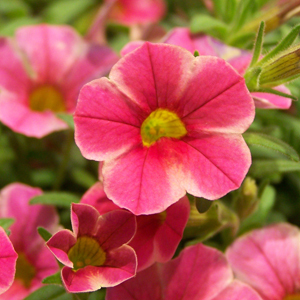 Our selection of annuals represents some of the best genetics in the industry and is known for their desirable characteristics and garden performance. There are a number of factors to consider and procedures to follow that will enhance the success and performance of your new annual. We have compiled some brief summaries of areas that will improve the performance of your new plants below. There are several factors to consider when deciding which annuals are right for your landscape. The most important consideration is the environment that you will be planting them in. Several environmental factors that may affect the performance of annuals include the amount of sunlight (full sun, partial shade, shade) the site receives, the moisture characteristics of the site (wet or dry), and the temperatures these plants are going to be exposed to during the growing season. Each type of annual performs best when it is planted in its preferred environment. Planting annuals in locations with inadequate conditions will greatly reduce their appearance and garden performance. For example, planting an annual with a heavy shade requirement in a location that has full sun will reduce the vigor and appearance of the plant compared to the same annual planted in shady location. For improved success, choose varieties that are known to perform well in the type of area you desire to plant them in. When planted in a suitable environment, annuals will provide you with a season long supply of color and enjoyment. There are numerous ways annuals can be used in the garden and around the home. They are most commonly used to add color and brighten up flower beds in landscapes. There’s a place for annuals in nearly any situation, from incorporating them in the vegetable garden to mixing them in landscapes filled primarily with perennials and shrubs, to planting them under trees and immature landscapes. Additionally, annuals are commonly used to liven up your outdoor living areas in patio containers, combination pots, hanging baskets, and window boxes.